This Intuitive Unconscious Thought Theory (IUTT) proposes that all the thought processes, which enable one to set goals by making sense of, modeling, or making predictions of the experienced world, are unconscious. The mind has conscious awareness only of the outcome of those processes. This new definition of “unconscious thought” includes all neural processes of which we have no conscious awareness. Historically, the term “unconscious” has had varied meanings. It was John A. Bargh, who proposed, in his NIH paper, that the term “unconscious” should mean the influences or effects of stimulus processing of which one is not aware and not the processing of stimuli of which one is not aware. “Unconscious” should refer to the process and not to the stimuli. In early 1800s, “unconscious” referred to the behavior of hypnotized subjects, who were not aware of the reasons for their behavior. Charles Darwin referred to the natural selection processes as “unconscious selection,” as compared to the deliberate selection of improved strains of animals through breeding, Freud introduced the concept of interpreting the thoughts within an “unconscious mind” through techniques such as random association and dream analysis, or Freudian slips. There have been several meanings for the word "unconscious." IUTT suggests intuition is the blind watchmaker, who makes the decisions of the mind, while conscious awareness is a narrow mirror, which reflects some outcomes of those actions. The experiments of Benjamin Libet showed that conscious awareness follows system decisions. Science has recently uncovered the claustrum as the region which promotes conscious awareness. The mind has a hierarchy of autonomous intelligences, which operate largely in the unconscious. The concept of emergence could offer a view of the unique quality of subjective experience. The controls of the mind switch between numerous independent intelligences occupying a triune brain. Control of the system by the will is quite over ruled by emotional controls. 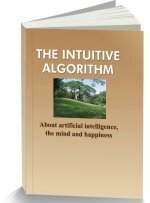 Intuition and combinatorial coding manage the mind. The current view of science is that conscious thought processes are intentional, controllable, serial in nature, accessible to awareness and verbally reportable. As a consequence, the term “unconscious” refers to behaviors or processes, which are produced either unintentionally, or without an awareness of its consequences. But, Bargh suggests that the term “unconscious” should mean the influences or effects of stimulus processing of which one is not aware and not the processing of stimuli of which one is not aware. In The Selfish Gene, Dawkins called nature the “blind watchmaker, the unconscious watchmaker,” because there was no conscious intentional guiding hand in producing the brilliantly intelligent designs of nature. The human mind represents the highest outcome of that design. 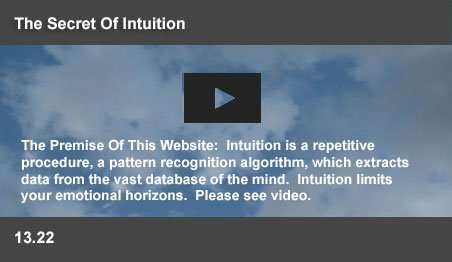 The IUTT explains that conscious awareness is merely a narrow mirror, which reflects the outcome of unconscious thought processes produced by a blind watchmaker called intuition. With IUTT, "outcome" implies an awareness of both the results of a decision as well as a broad awareness of the reasons why the decision was made. According to Bargh, the broad scientific consensus is that conscious thought processes are “intentional, controllable, serial in nature and accessible to awareness.” Consciousness is generally assumed to be the process, which largely controls the mind. But this is not true. Conscious awareness is only a belated observer of the activities of the mind. Benjamin Libet reported his experiments on subjects who voluntarily pressed a button, while noting the position of a dot on a computer screen, which shifted its position every 43 milliseconds. The nervous system had made the decision, not conscious awareness. That crucial time interval also defines the measurable aspect of consciousness. Consciousness merely reports brain activity after it has been completed. Conscious thought processes do not control the mind. It is the blind watchmaker, who makes the decisions of the mind at myriad levels. But conscious awareness "knows" both the making of the decision as well as the reasons for making the decision. Recently, science has managed to capture the mechanisms at the critical point where nerve impulses become thoughts. Objects or events in the real world have many attributes, including color, shape, distance, velocity, smell, sound and feel. A PET study by Hadjikhani revealed the involvement of the claustrum in cross-model matching, in tasks that require the simultaneous evaluation of information from more than one sensory domain. Without this structure, the subject may still be able to respond to simple, isolated or to highly familiar stimuli, but not to complex or unfamiliar ones. The claustrum appears to enable the conscious experience, where these objects and events are perceived in an integrated manner and not as isolated attributes. The claustrum appears to be the region, which is a “dashboard,” which displays your thoughts. The lower level systems in the brain are substantially autonomous and their sensing, feedback and control processes fall compulsorily into the unconscious thought category. The nervous system contains a hierarchy of self contained and autonomous intelligences. These regions maintain their own constant states within the body in a changeable environment. The autonomy of these self governing regions has been confirmed by a massive base of experimental evidence on the "homeostasis" of animals, which enables each region to maintain a steady state, even when severed from the whole. As higher levels are included with the spinal cord below the cut off section, more effective controls are retained. Each region demands only critical inputs from higher levels. When severed from above, the levels below the thalamus are reported to manage a wide range of activities including “feeding, drinking, apparent satiation and copulatory responses” in a broad range of adverse conditions. The various organs and subsystems below follow the decisions of the “blind watchmaker.” Apart from a vague conscious awareness of the final results of these actions, all the processes at the lower levels fall into the category of unconscious thought. Science has discovered many neural correlates of conscious awareness. The mind converts the multi-sensory perceptions of millions of isolated world events into nerve signals. Chemoreceptors in the tongue report taste. Other receptors are massed together to form sense organs such as the eye and the ear. Chemicals from damaged tissue cause nociceptors to fire and report pain. While the occurrence of these events can be explained, nothing in the physical world can explain one's subjective experience of the three dimensional world of color, sound and sensations. While billions of nerve cells fire to enable one to subconsciously recognize the ideas in this page, or manage one's breathing, there is an entity, scientifically linked to a small fraction of the multi-billion cell network, which sees and comprehends the words on this page - conscious awareness. Conscious awareness has been linked to the claustrum. Benjamin Libet has linked conscious awareness to the physical world. In the theory of complex systems, emergence is the effect, where new patterns arise out of myriad simple interactions. New properties do emerge at higher levels of complexity. Psychology emerges from biology and biology from chemistry. The whole completely differs from the sum of its parts. Could conscious awareness emerge into a non physical knowledge dimension as the complexity of a neural network increases? Even if conscious awareness is as physical as biology, it does not control. Libet's experiments reveal it to be a mere spectator. The conscious mind is only aware of the results and the broad reasoning behind the massive subconscious processes. Above the autonomic control systems at lower levels, Paul D. MacLean proposed the term “triune brain,” which defines distinct evolutionary stages in the development of the human brain. The earliest organs developed to form the reptilian brain, including the reticular formation, and the cerebellum. This region controls the muscles, balance and autonomic functions, like breathing and heartbeat and is primarily reactive to direct stimuli. This was followed by the limbic system, connecting thalamus, the hippocampus, the septal areas, the amygdaloid body and the insulae. The limbic system manages emotion based controls, including fear and anger, as well as guilt and love. Emotional decisions are not conscious decisions. Paul Eckman, the famous emotions scientist said "We become aware a quarter, or half second after the emotion begins. I do not choose to have an emotion, to become afraid, or to become angry. I am suddenly angry. I can usually figure out later what someone did that caused the emotion." While emotional decisions are made by an unconscious thought process, the conscious mind senses both the emotion as wells as its reasons. The cerebral cortex developed in the brains of higher mammals. Occupying a far larger percentage of the brain than any other animal, the prefrontal cortex in humans is responsible for higher-order thinking skills, reason, speech, and sapience. Within the triune brain, the prefrontal region is known to be the seat of judgment, with the ability to decide on the moral implications of a course of action. At the highest level, the decisions of the prefrontal cortex evaluates all available information and makes unemotional decisions. The philosopher Rudolf Steiner suggested that true freedom of action existed only “when conscious awareness was integrated with moral imagination in making decisions.” A person is truly exercising control if he has the power to choose a course of action without external coercion in accordance with his ideals or moral outlook. Such a decision can be termed an exercise of will by the mind. Even then, the nervous system can over rule will, the decision by the prefrontal regions. Try this thought experiment. Can your will raise your hand? Yes, when you are sitting quietly in your room. But, suppose you are in an elevator with other passengers. Then, it is inappropriate to raise your arms. Even in the interest of science, if you will this action in that situation, it will not happen. If you continue these experiments, you will find that your will is overruled, when an action is not Worthwhile, Appropriate, Safe, or Practical (WASP). It is obvious that, any imagined control is subject to being over ruled by the unconscious thoughts system. Understanding the unconscious mind requires an overview of the hidden drives operating in the nervous system. Beneath conscious awareness, powerful drives support human speech. When a person begins to speak, the system responds to a specific emotion, organizes an idea, finds the right words, arranges them in order, checks grammar and operates the vocal chords. The individual has only an awareness of the final outcome. When you decide to move a piece on a chess board, a specific drive takes over. It controls the sequences of motor impulses, which persist from the instant your hand picks up the piece, till it is set down in its new position. Muscle movements are sequences of contractions, which last just milliseconds. Each signal invokes only a tiny contraction. Myriad muscles have to contract and relax over thousands of cycles till your chess piece reaches its desired position. Your hand does not wander off on its own. The unconscious process moves the hand over obstacles and places the piece precisely in its new location.. Those too are unconscious thought processes. IUTT suggests that the blind watch maker has installed a massive wisdom in the nervous system as combinatorial memories. Such memories were discovered to be applied for hundreds of millions of years by the olfactory sense (Nobel Prize 2004) for the instant identification of odors. When nerve cells fire to support a remembered mental function, the presence of human memory is proved. The neuron fires, when it recognizes a combinatorial pattern in the array of its receiving dendrites. The pattern may be a single signal in the array, signals in a channel in the array, or a specific combinatorial pattern of signals in the array. IUTT suggests that the physical and mental experiences of the mind are stored by nerve cells as memories for contextual combinatorial patterns. Such memories, which cause the cell to fire, may be further consolidated through LTP, neural plasticity, or neuronal reverberation. While most such memory is implicit, a small proportion of this vast store remains available for conscious recall. Intuition is the pattern recognition routine behind each intelligent animal response. Intuition enables nerve cells to swiftly recognize, interpret and act, by extracting logical answers from astronomically large combinatorial memories. An unconscious mind, a blind watchmaker, pulls the levers behind the brilliance of human creativity, while conscious awareness floats mysteriously in space. This page was last updated on 12-Sep-2016.